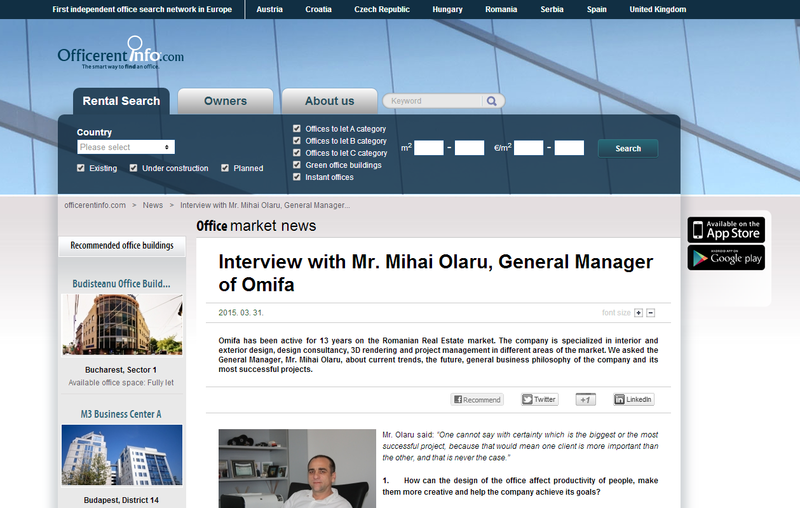 Omifa has been active for 13 years on the Romanian Real Estate market. The company is specialized in interior and exterior design, design consultancy, 3D rendering and project management in different areas of the market. We asked the General Manager, Mr. Mihai Olaru, about current trends, the future, general business philosophy of the company and its most successful projects. 1. How can the design of the office affect productivity of people, make them more creative and help the company achieve its goals? The way an office is designed can impact on the way the respective business is run. Long are the days when people just went to work in the morning and got back at home in the evening, the time they spend in their working environment takes up most of their day. Thus, any detail can make the difference: from the chairs they sit on at their desks to the way the common, relaxation spaces are laid out. A content employee focuses on the task at hand, thus helping the company achieve its goals.